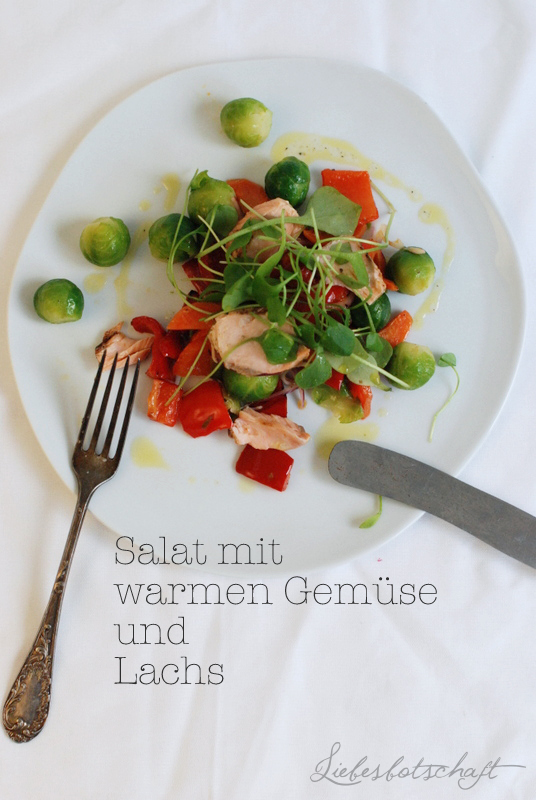 Liebesbotschaft International: 3 best winter salads! 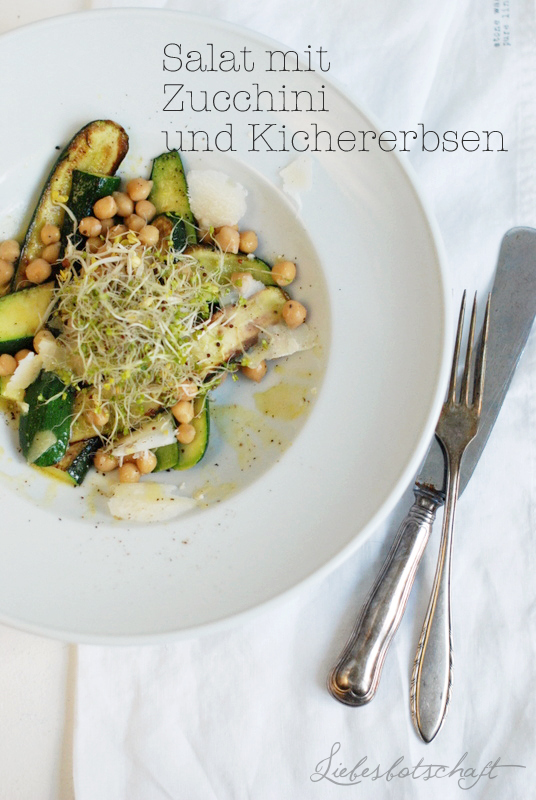 Today I will tell you about our currently favorite 3 winter salads - they are prepared partly with warm ingredients and are perfectly seasonal. I prefer eating them for dinner, as they are light yet filling, but you can, of course, enjoy them for lunch just as well. And the preparation is very quick and uncomplicated! 1. 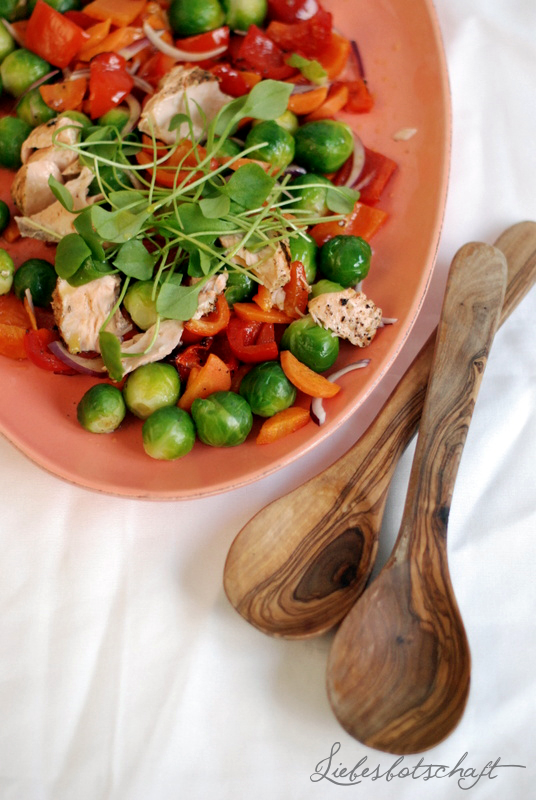 Salad with warm vegetables and salmon. 3 salmon fillets, each about 3.5 oz. Optional: a little bit of a delicate type of salad, such as purslane, etc. Peel and slice carrots, wash bell peppers and cut into chunks. Distribute both on a cookie sheet, season with salt and pepper, drizzle with 2-3 Tbsp of olive oil and mix everything well. Put into oven for about 15 minutes, the vegetables are supposed to still be al dente. In the meantime season salmon with salt and pepper, drizzle with a bit of lemon juice and place onto the grill, or sauté in a frying pan. Wash and clean Brussels sprouts (cut off the slightly darker ends and maybe remove 1 or 2 withered leaves) and cook in a pot of salt water until still firm to the bite. Slice red onion very finely. Mix together all ingredients for the dressing. 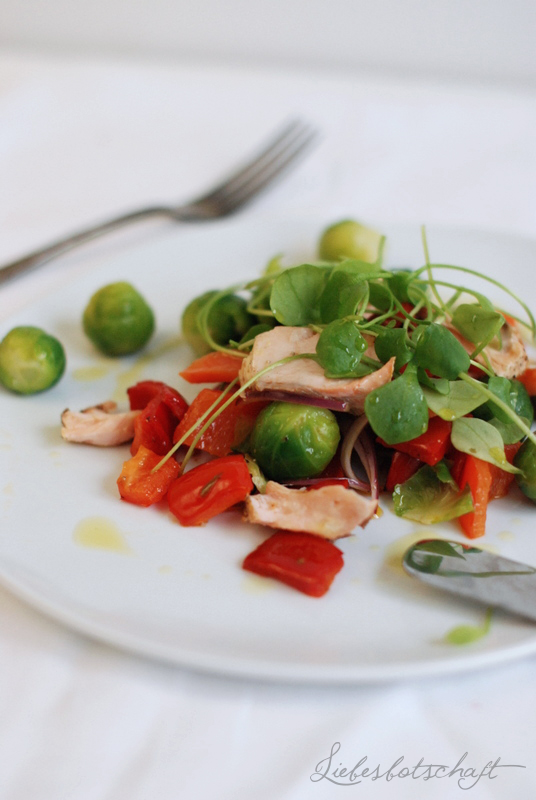 Remove vegetables from the oven, drain Brussels sprouts and mix both well with the dressing and the sliced onion, cut salmon into chunks and add to salad. Top with a bit of fresh purslane. Cut zucchini lengthwise into thin slices, and briefly fry in the pan with a bit of olive oil, season with salt and pepper. 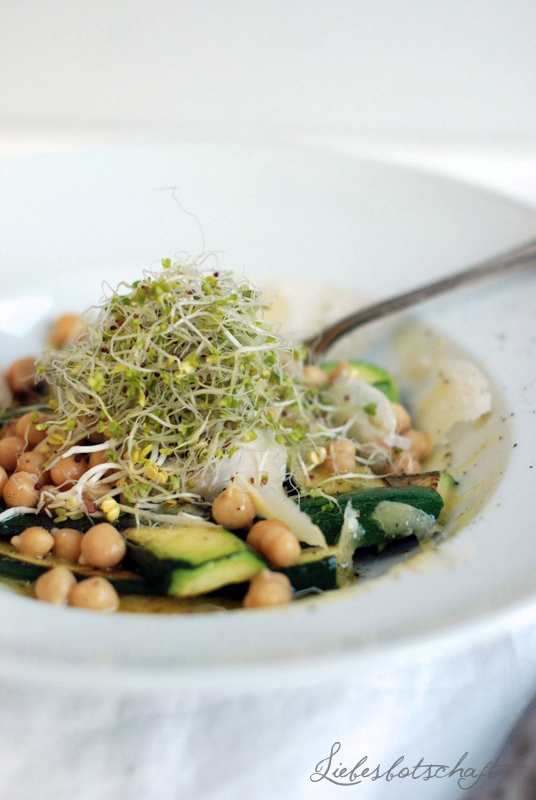 Mix zucchini, garbanzo beans and dressing, add shaved parmesan and top with sprouts. 3. Winter salad with fried feta cheese, pomegranate seeds and mango. 2-3 handfuls of a mix of winter salads per person: mache, radicchio, water cress, etc. Then fry the pieces in 3-4 Tbsp olive oil until golden brown. In the meantime wash and clean lettuce, dry well. 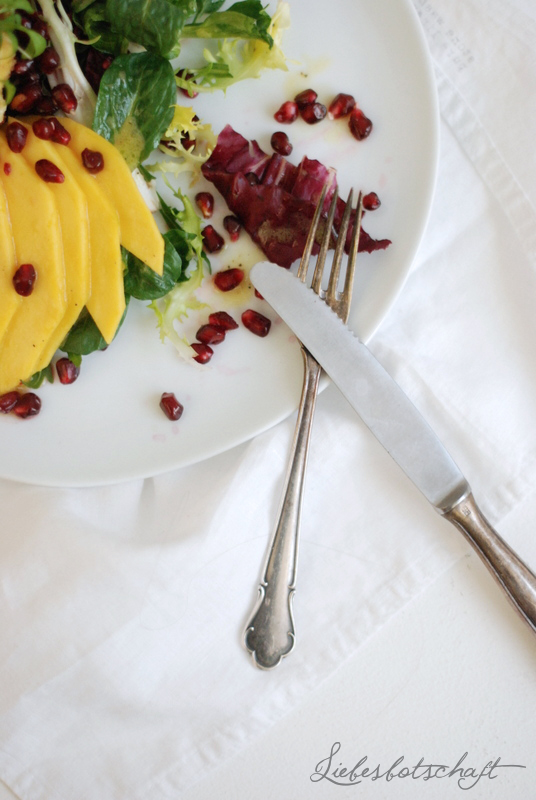 Peel mango and cut into thin slices, mix all ingredients for the dressing well. 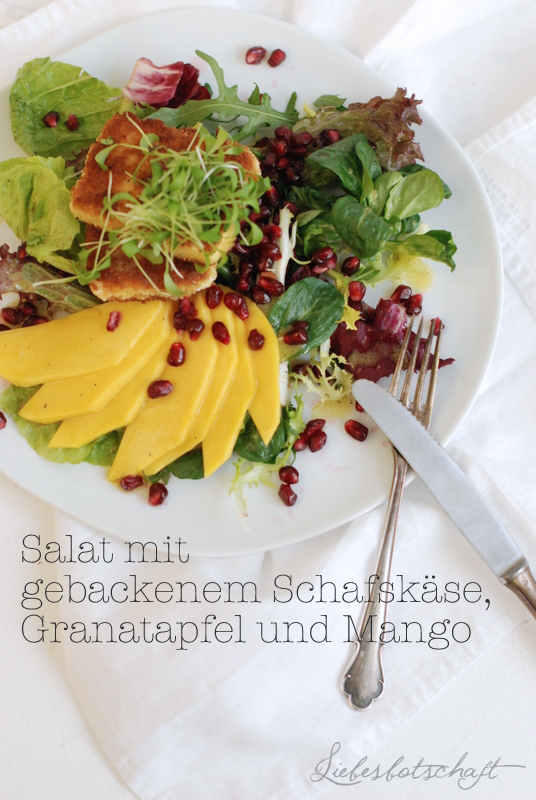 Arrange on a plate, sprinkle with pomegranate arils, add dressing and top with some watercress. This salad is very tasty when served with some bread or baguette, the others will fill you even without it. I am curious which one of them you will like best! By the way: if you do not like Brussels sprouts, you can replace it with broccoli or Romanesco florets. I do like serving the salads on the big, colorful platters available at geliebtes Zuhause.